"The 'Gill Buster' is one of my favorite bass flies....."
E-mail: davidbarfly@yahoo.com Dave does most of his fishing four miles from home, on East Lake Toho, where he fishes for Bluegills and Bass from his pontoon boat. However, his primary love is saltwater fishing. He and his wife of 40 years moved to Florida from Connecticut nine years ago. Dave first wrote to me just days before retiring from the Post Office, after 25 years. Now he can do what many of us dream of: fish every day if he wants. One day in April my fishing buddy Joe said, "let's go down to the Miami Canals and fish for Oscars." So, of course, I agreed to the 4+ hour trip. The trip would have been faster, but absent-minded Joe forgot his lunch and drinks, so on the way he ran into a Wal-Mart which added another 20 minutes. To get to the part of the Miami Canal that we were going to fish, you have to drive down a 12 mile dirt road with more pot holes than dirt. We finally put the boat in around 11:30 AM. Armed with a 9- foot 4/5-weight rod and casting one of my Gill Busters at the end of a 9-foot 4X leader, I hooked an Oscar on the first cast. If you have never caught an Oscar, it seems they wake up with a BAD attitude and fight like all Hell. I even had one Oscar come out of the water and jump into a tree! Another fish that we caught is a Mayan Cichlid. Mayans are like Bluegills, but I think they take steroids. One thing about the Miami Canal is you had better not put your feet or hands in the water. This place is loaded with BIG alligators. We had gators all around us, just swimming from one bank to the other. Though the fishing remains good into the evening, we fished only until 6 PM because we had a long drive home and having spent the day in the hot sun did not help either. Anyway we ended the day with 68 fish; most were Oscars and Mayans and a few Gar, Bluegills and Bass. It was a day I will never forget, and one I can't wait to do again in the near future. 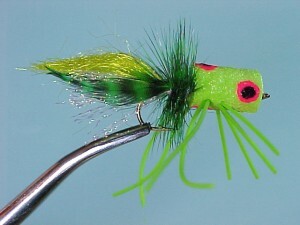 The "Gill Buster" is one of my favorite Bass flies. It has brought me many "surprises". I am fortunate to have East Lake Toho within four miles of my home in Florida. Once, I cast the "Gill Buster" from my pontoon boat to a mass of reeds ... and BAM, a big fish hit it and ran all over the place. After the battle slowed down, I said to myself "that's one Big Bass". Well, when I finally got it into the boat I found out it was a big Mudfish (Bowfin). I was surprised and disappointed that it wasn't a monster Bass, but it was great catching. Another "surprise" occurred when I was fishing in a small pond behind my house. I cast a small Gill Buster and hooked a small Bass. But when bringing it in, a 6-foot alligator came from under the water and ate the Bass. I had the gator on for a few minutes before the line was cut.